Posted on Monday, September 12th, 2011 at 8:20 am. 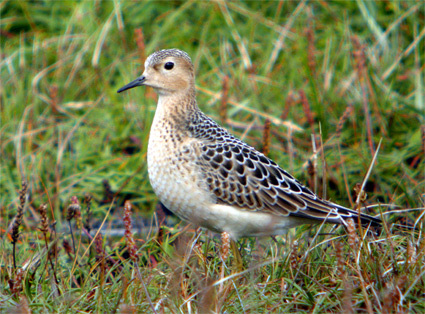 This was one of a flock of five found on short grass right by the sea just along from Loop Head. Initially the birds (or at least four B-b S) were picked up in flight in a flock of Ringed Plovers that were flying over calling. I heard the flock as I was trying to record Choughs, and merely lifted my microphone to record the vocal Ringed Plovers without bothering to look at the flock! Luckoly, after a search we found the quintet and had crippling views. And this came after Keith found one at the seawatch place, clearly just arrived from North America.